In the end, I had to leave Adelaide as I couldn’t afford to pay another week at the caravan park if I didn’t have hope of some income on the way soon. So I took a leap and hit the harvest trail. I’m in Loxton, in the Riverland of South Australia (near Berri, home of the famous juices/fruits etc) staying at the Harvest Trail Lodge, which is just about the most grotty backpackers I think I’ve ever been in! 😦 Unfortunately if I want the work I have to stay here apparently – the lodge organises the work teams for the farmers. I’m going to check out exactly how true that is if I decide to stick it out for more than a couple of weeks. 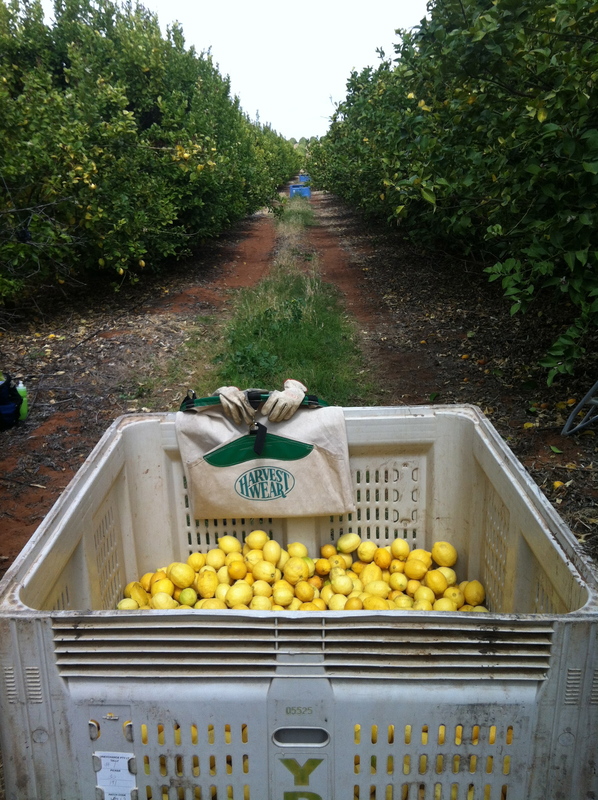 My full bin on day one was partly because I got the lemons from another new girl working in the row next to me who gave up after a couple of hours and went home. Today, I didn’t finish a bin. It didn’t help that it started raining an hour or two before we’d normally finish (we can’t pick when it rains, apparently the fruit gets too damaged) but even so I doubt I would have made it. Apparently it will be waiting for me on Friday (the forecast for tomorrow is still pretty shocking). So I have a whole new respect for overseas backpackers! Most of them are doing this to get their second working holiday visa so they can stay in the country a little longer, the money seems secondary. Some actually think the pay is ok! 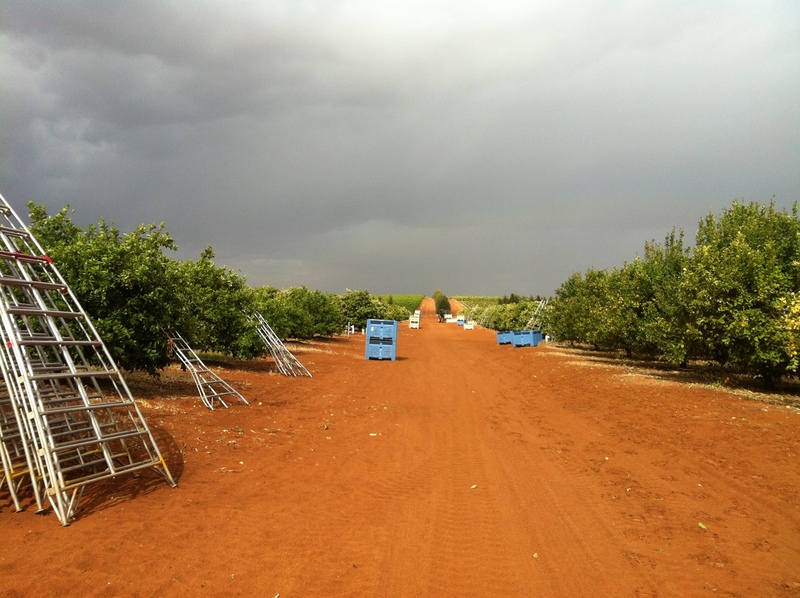 (Those who can’t hack the “good paying” lemon picking often ending up doing almonds instead, where a solid worker can earn $48 a day by filling 8 or so bins, but it’s not as nasty as the lemon picking.) Wow. I suppose if you can finish 3 or 4 bins a day (which some do apparently, including a tribe of tiny Japanese girls) then it is ok money. But bloody hard work in the process! I’m amazed at the lack of induction, tips and tricks etc or any health and safety talk before new people start. They are either making huge assumptions about people’s knowledge and understanding, are trying to sort the time-wasters from the genuine workers, or perhaps have no idea at all why induction and H&S are important. I find it incredibly there aren’t more incidents. Today I nearly disturbed a large bee swarm; the supervisor didn’t know they could even happen. Actually, it’s almost as though they want to set new workers up to fail. Only after I asked the supervisor 2 hours into day one, did I get a demonstration of how to launch the ladder in to the tree to get the best and safest access to the top. Only halfway through the day did he tell me some of the things people do to protect their wrists from ending up like they’d been fighting cats. (mine look like I’ve been fighting cats. Yes, multiple cats). He bawled out the girl next to me for not picking fruit from the tops of the trees – but never detailed clearly at any point that we had to do that, or why. He perhaps thinks it’s obvious. He complained about the stalks left on the fruit but hasn’t explained why it’s important that they are not. At no time on their website, or in the correspondence I had with them before coming, were they clear about the work demands – ie climbing ladders, getting scratched etc. To their credit I suppose, if someone can’t handle the lemons there are plenty of other jobs they try to channel them towards (like the lowly paying almonds). So, it’s an adventure all right. I swear I must be the only Aussie here, probably a good 10 years older than everybody else. Some folks are really friendly though, and most seem ok on the whole, so I think I’ll survive. As for the lost three weeks since my last posting – bear with me folks! I’m part way through a few separate entries to do with my time in Adelaide, (I did manage some stuff other than job hunting!) and I’ll get round to finishing and posting them in the next week or so. Anyway, I’m now applying for jobs with the grain harvest – at grain receival depots – and I can tell from the application process already that they’re a bit more switched on about providing a decent working environment! So I’ll see where I might end up with that. Hope all is well in sunny Gero!